The Optometric Eye Site offers a full scope of options to alleviate your dry eye symptoms. Mild Cases of dry eye can be treated with artificial lubricant drops or gels( artificial tears). However, Moderate to severe dryness is often more difficult to manage and require punctal plugs. Tears normally drain into the puncta and down into the nasal cavity. 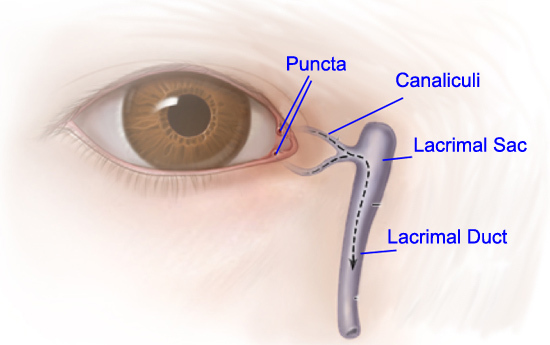 Punctal Plugs inserted into the puncta obstruct this tear flow and cause more tears to remain inside the eye. Inserting punctal plugs is simple surgical procedure that provides long-term relief of Dry Eye Syndrome that involves the use of permanent, yet removable plugs called punctal plugs. The idea behind punctal plugs is simple. Tiny, plugs are inserted into your tear drainage ducts (puncta) where they block the flow of tears. This forces your tears to remain on the surface of your eye. The extra tears add to the total amount of the eye’s lubrication which can help to improve the health of the eye. Extra tears in the eye can also make your contact lenses more comfortable, so some patients elect to use punctal plugs to enhance contact lens wear. Puncatl Plugs are not always the best option. During their eye examination, sometimes patients are reluctant to have a minor surgery performed on their eye and in cases of ocular surface disease such as conjunctivitis or ocular allergies, punctal plugs are contraindicated. In these cases Eye drops and artificial tears temporarily soothe the symptoms of Dry Eye Syndrome. For eye surface diseases and conjuctivitis, mild steriods and antibiotis are also effective. However, using to many drops on the eye does wash away the natural infection-fighting tear film on the eye. Therefore, an eye doctor should manage all of these types of issues. Please view our dry eye section for more information on dry eyes as well as our download center for information on plug pricing and risks.